NGC 247 (aka Caldwell 62) is a dwarf spiral galaxy in Cetus, and it is a member of the Sculptor Group, the nearest group of galaxies to our Local Group which includes the Milky Way. NGC 247 has a slightly irregular shape on one end where the spiral arm has a hollowed out appearance on long-exposure photographs, resembling the shape of a neddle's eye. 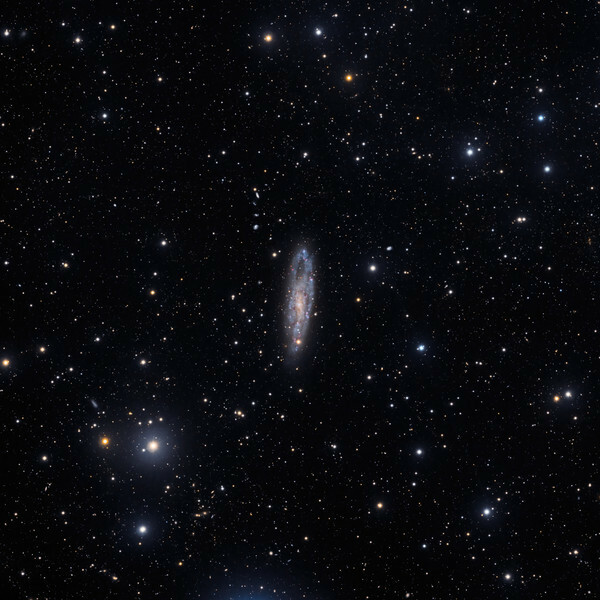 It is about the same size as NGC 253, but two magnitudes fainter. Recent measurements placed this galaxy about 11 million light-years away, about 1 million light-years closer than the estimated distance of NGC 253. In the above wide field image is also revealed the rich background of this area which features a multitude of other galaxies, located a lot farther from our planet than NGC 247.